Caleb had a short life. He was born on January 28, 2001. He came in to my life on May 26, 2001. 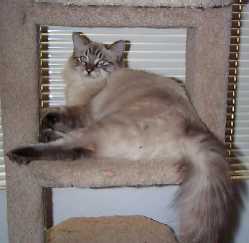 I had recently lost a beloved cat and wanted to get another cat to help my grieving Himalayan, Teddi. So I brought home Caleb and his littermate Joshua. They were both adorable and easily won my heart. computer. He was fascinated at the arrow that would dart around the screen. Himalayan. And especially by his brother, Joshua. He is gone, but he won't be forgotten.